In this section we attempt to view the system from the IT point of view. 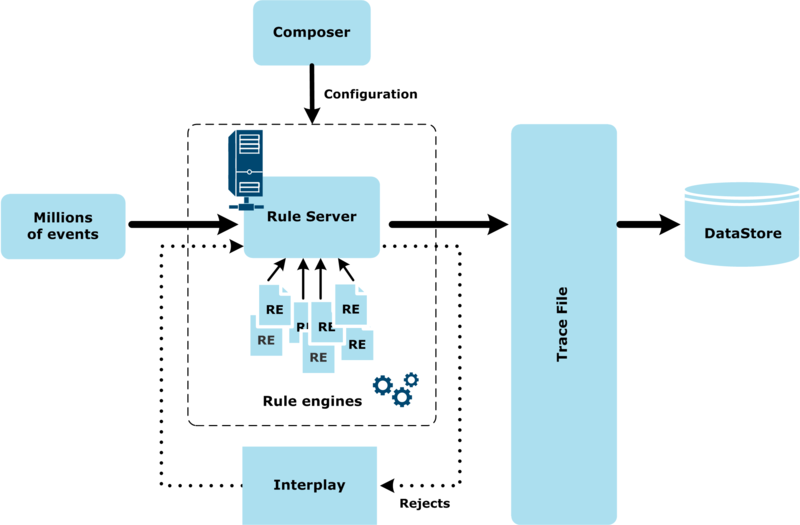 The Rule Engine Server takes in files, containing millions of events and dispatches them to a number of Rule Engines. Note that in a number of configurations the Rule Engines function without the help of a Rule Engine Server. Trace files , typically millions of lines long, that are transmitted to Axway Datastore. AI Suite Studio produces output that is understandable to both IT and accounting people. All monthly repayments for 15-year 3.2% mortgage plans. When new events appear in the Trace file, the sampler checks whether a corresponding block of information already exists. If not, it adds that block to the file. A single block of information in the sampled file thus represents thousands of lines in the Trace file (symbolized by the fact a single blue square in the sampled event file replaces several blue squares in the Trace file). AI Suite Studio then displays the output in a UI showing methods, events and products, in a way that is accessible to both IT people and accountants.